There are hundreds of Panama islands, from the massive Coiba Island to the perfectly tiny Kuna islets. Some are extremely tourist-friendly, like Isla Colón in the Bocas del Toro. Other Panama islands are remote and uninhabited but still packed with biodiversity. Explore the islands of Panama! The Bocas del Toro Islands are Panama's most popular travel destination. Located in the Caribbean Sea, close to the Costa Rican border, they can be reached by ferry, water taxi, or plane. The largest of the Bocas del Toro islands is Isla Colón, home to Bocas Town (also called Bocas del Toro). Approximately 13,000 people live in Bocas Town, which also offers numerous hotels, restaurants, and other tourist attractions. Neighboring Bastimentos Island is another great destination, particularly Red Frog Beach (named for the tiny red poison dart frogs dwelling there). 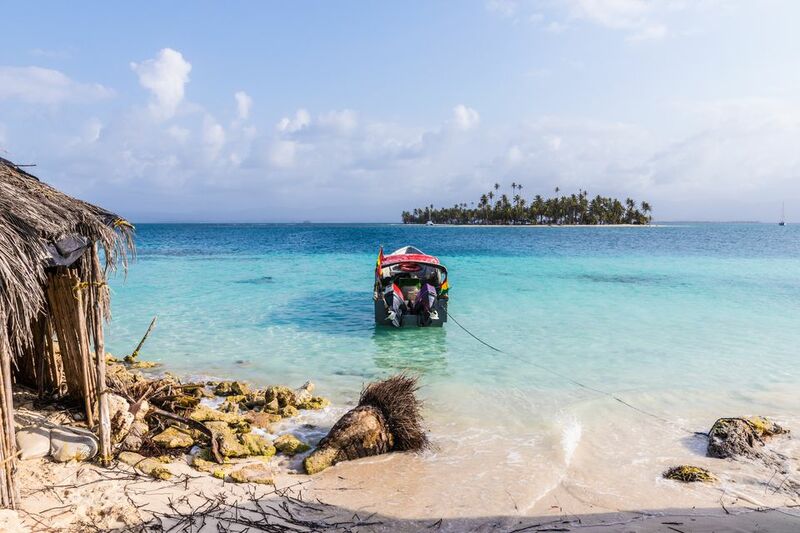 Other Bocas del Toro islands are less traveled, but equally stunning—such as Solarte Island, settled by the indigenous Ngöbe-Buglé people, and the Zapatillas Cays, part of Isla Bastimentos National Park. Along with Coiba Island, dozens of Panama islands are located in southwest Panama's Gulf of Chiriquí. Most travelers exploring the region start in the town of Boca Chica, where transportation can be arranged to the gulf's islands. The island of Boca Brava, for example, is just half a mile away. Isla Palenque is near Boca Brava; both are great destinations for hiking and sport fishing. The Islas Secas ("dry islands") is an archipelago consisting of sixteen pristine volcanic islands, and are home to the Islas Secas Resort. The Pearl Islands archipelago includes approximately 100 islands, many of them tiny and uninhabited. They're located in the Gulf of Panama, around 30 miles from the coast. The islands have a wild, castaway feel—in fact, the CBS television show survivor filmed three seasons on islands in the archipelago: Survivor: Pearl Islands, Survivor: All-Stars, and Survivor: Panama. The largest and most travel-friendly of the Pearl Islands is Contadora Island, which boasts a small airport (flying time from Panama City is just fifteen minutes). In Spanish, "Contadora" means "counter"—appropriate, since the island is where Spanish conquistadors would count the pearls harvested from other Pearl Islands. At 74,000 acres, Isla del Rey is the largest of the Pearl Islands and the second-largest island in Panama (after Coiba Island). Isla Barro Colorado is an island in Panama's man-made Gatun Lake, in the middle of the Panama Canal. When the Chagres River was dammed to make the lake, all the rainforest was flooded except for the hills, which now make up the island. It houses the Smithsonian Tropical Research Institute, where scientists study the island's flora and fauna. According to them, Barro Colorado "is one of the most studied places on Earth and has become a prototype for measuring the diversity of plant and animal life around the world."